Sometimes the player or parent does not create the RYAA website account themselves. This is most commonly a result of the paper registration process. This process may also be used if your password gets lost of forgotten. 1) On the RYAA website, click the link labeled "Login to RYAA" on the left side of the page. 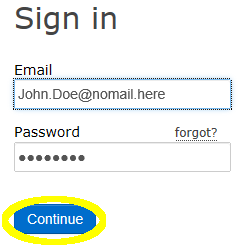 2) On the "Sign In" page, click the link labeled "forgot?". 3) Enter the email address used during registration. 4) Check your email for a message containing your new password. 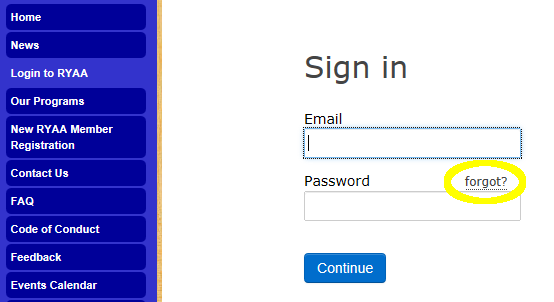 5) Return to the "Login to RYAA" page, enter your username and new password and click the Continue button. Congratulations, you have now successfully logged onto the RYAA website! From here, you will be able to select or add a family member and edit their information as necessary! 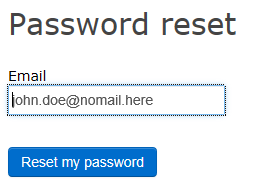 You may continue to use the password sent to you or change the password to something more easily remembered. For more information about changing your password, please visit this page.